Those attending the 2015 Session of the Mississippi Annual Conference in June will witness Mississippi clay sculptor, Robert Pickenpaugh, shape an image. His presentation will take place during the opening worship service. Writer Robin C. Dietrick, introduces Pickenpaugh in the article below from the book, I am a Craftsman: 40 at 40, copyright by the Craftsman's Guild of Mississippi. Photos of Pickenpaugh's work can be viewed at www.pickenpaughpottery.com. 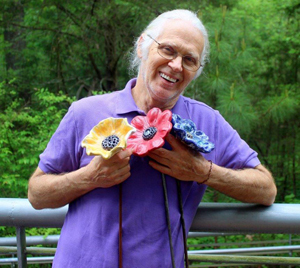 Pottery has been a spiritual journey for Robert Pickenpaugh. Viewing clay as the essential matter of humans, he likens centering the material on the potter's wheel to centering one's life. A stillness must be sought and achieved in order to make pottery work well, he says. The same stillness of spirit sought and achieved makes life work well, he believes. "And then you become this one with all, you could say one with God," he says. "And what you're doing when that happens to you, is you're not at that moment living outside yourself anymore. You're living inside of you and that's where you find the omnipresence of God. Or yourself, or of that stillness or that quietness, that oneness that everybody seeks." Pickenpaugh is part of a creative cycle. At one point in his career, he contemplated pottery traditions, but now finds he achieves greater success by not forcing any preconceived approach on his work. He has noticed creative patterns in his work where every piece he fashions metaphorically builds on the others repeatedly, until he reaches a peak or moment when he feels he has found a "oneness" in the work. This peak lasts for varying times; before long, it is over, and the process begins again. The secret of pottery, Pickenpaugh advises, is to find the right girl who will tolerate it, as he has. Robert's wife, Merry gradually worked her way into pottery after they opened Pickenpaugh Pottery at Madison in 1973. Not wanting to influence her style, Robert stayed away from teaching her directly, but now she is an integral part of the creative team. Together, the couple makes an array of pottery from traditional pieces to purely aesthetic objects. Robert mixes their glazes, relying on intuition, but also making notes about the recipes along the way. He also mixes the clay, which is primarily from his native Kentucky, incorporating a handful of Sledge, Mississippi, minerals into each batch. The Pickenpaughs' finished pieces are diverse, but they all exhibit an earthy, imperfect look, partly due to the drippy, earth-toned glazes washed over them. The objects themselves often have carvings, stamps, or shapes applied featuring natural motifs like leaves or branches. Robert has even constructed gardens full of clay flowers. Robert Pickenpaugh points out he is "standing on the shoulders" of the wonderful teachers from whom he has learned during his life -- his first pottery teacher being Malcolm Norwood at Delta State University. Pickenpaugh strives to be part of the teaching foundation to provide shoulders for a future artist. He does this through demonstrating almost weekly at the Mississippi Craft Center, teaching classes at his own studio and working with children in schools when he can. Clearly, Pickenpaugh is inseparable from his creative spirit and the passion he seeks to transfer to future artists and problem solvers of tomorrow.